There’s a simple trick to enjoying the Lake District’s busier routes – start at lunchtime. The hordes not only all head for the same few hills, but all set off at the same time. At 9am, the start of many popular routes resembles rush hour on the London Underground as people jostle for space to pull on boots, stuff rucksacks and browse maps. 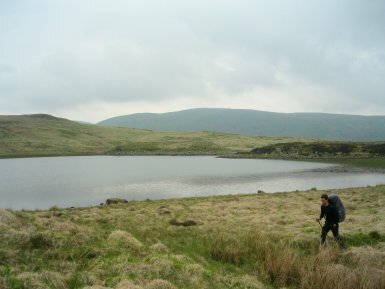 The Kentmere Horseshoe is one such walk. 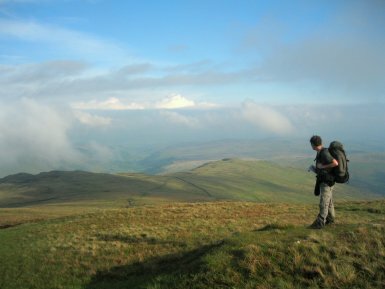 Kentmere village, the usual starting point of the Horseshoe, is only accessible by public transport on Sundays and bank holidays, when the Kentmere Ramblers winds up the valley. Being a weekday, we decided instead to start at Staveley and extend the trip to a two-day effort, with a wild camp high on the fells. But with a full day to kill, Gary and I decided head for hobbit-style ‘second breakfast’ at Wilf’s Café in the village – reason enough in itself for loitering a while before the start of a walk. Soon after leaving Staveley, my belt straining from the slice of cake and coffee (we managed to squeeze in elevenses at Wilf’s too), we reached one of my favourite Lake District corners, one with a splendidly northern-sounding name. Skeggles Water … with a rasping ‘sk’ at the start, followed by a glottal ‘gg’, it could only be from round here. You don’t get names like that in the Cotswolds. Not only does it have a great name, it’s also wonderfully serene. A vague path from Brunt Knott leads to the water’s edge, from where wading birds pottered away to the far side as we approached. The low cloud blocked out the surrounding landscape, adding to the sense of isolation, and we lingered until the dampness from the marshy ground seeped through our trousers. I love it when a plan comes together. Apart from a brief hallo from a sweaty, red-faced fell runner on Shipman’s Knott (why do they do it? ), we had, as hoped, the fells entirely to ourselves, even though it was just gone 2pm. The fells are completely transformed when deserted – the calls of birds carry further, the views merge into an unadulterated panorama of greens and greys, and walking once more feels like something special. I’ve nothing against others visiting these places – far from it, the more the merrier (as long as they come by bus or train) – but sometimes I like to enjoy them with just the company of a friend. Kentmere Pike and Harter Fell worked off the last of the Wilf’s offerings and we camped on a small hollow near Lingmell End, overlooking Small Water. 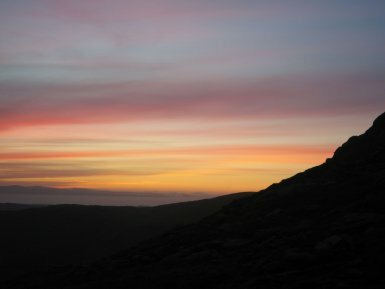 Boots off and my rucksack luxury – sandals – on, and we toddled of for an evening explore of the surrounding crags. The view down to Kentmere Reservoir revealed another normally crowded spot transformed into a tranquil secret – perfect when enjoyed with some hot chocolate and a warm sleeping bag waiting. Next morning we set off to complete the circuit via Mardale Ill Bell. Despite an early start, we encountered the first walkers on Thornthwaite Crag; this had increased to a steady stream by Froswick and a torrent of red and yellow waterproofs by the time we reached a rainy Yoke. Good luck to them, and I am sure they took away their own memories of this route. But I know which way I prefer. Staveley is on the line from Oxenholme to Windermere. Also buses to the village. Under canvas if up on the hills. Plenty of options in Windermere if you finish there, or campsites in the Troutbeck Valley.